It's hard to believe that we're at the end of the year already. It seems like just yesterday I was at Manager's New Year's Eve party wondering who would attend with me after Vegas moved. This past year has been full of so many changes, yet so many other things have stayed the same. In staying with the general theme (give me credit, I like to believe that this site has a direction. lol) here are the major items that happened to me in my running, riding, reading, and repeating! This year started slowly in terms of running. I did the bare minimum in mileage and ran races that I was a bit underprepared for. But I quickly turned it around and joined the Disney Springs Fit2Run Galloway Training Group which helped me jump start my running program into something more productive than it had been. While I'm only a casual member the group at the moment, because of the early darkness, I am looking forward to continuing my running journey with them. I was able to PR my 10k and place in my age group for a 5k because of them. On the topic of my 10k PR at the Celebration Pancake Run 10k, it was a bit disappointing but it is a huge milestone for me. If you check out my races tab you'll see that my PRs haven't really changed in a few years. This is entirely my fault because I am the least consistent runner I know. I had hoped to PR in the 5k at the Jingle Jolly Jog, but my mental game wasn't there. I am so proud of my first age group award. I have lusted after them for, what feels like, ages so it is extremely exciting to finally have one on my wall! Ok, it's actually in a shoebox under my guest bed because I have yet to find a medal holder that I love, but that isn't the point! Easily, the biggest thing that happened to my riding career, this year, was purchasing Cupid. I spent weeks last year debating about purchasing her, and I officially made the plunge on January 11th. I never imagined that my horse would be a little Welsh pony cross, who was green broke with a major attitude. But here I am, with my little Welshie who still has a major attitude, and is slightly better than green broke. Honestly, I wouldn't trade in our partnership for anything. Owning a green pony has taught me so much about riding, patience, and myself. For every step forward there are two steps back, but once we make a leap forward the landing is extremely rewarding. In addition to purchasing Cue, I also uprooted her and moved to a new barn. Shortly after purchasing Cupid I realized that our current situation was not working out. 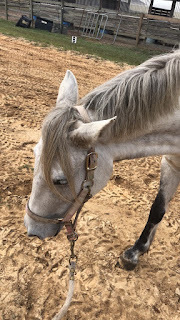 The care wasn't what I wanted for my horse, I felt cheated out of my lesson package, and I was extremely nervous having my partner in a barn with minimal supervision. It took me until May to find a stable that met my standards. The major sign that this was the place for us was when we ran into our new trainer at a show before I had even told our old trainer we were leaving. The new trainer made several observations about Cupid and I, then commented that she would love to take us back to the basics because "she's a baby and there's no need to rush her". Hearing this proved to me that she would have Cupid's best interests at heart which is all I wanted in a boarding situation. Moving Cupid was the best choice I could make for her. She's happy at our current barn, has put on much-needed weight, and is slowly becoming a solid partner for me. We still have a long way to go, and I miss jumping, but watching her move properly and understand what I'm asking has been worth everything we have been through. According to GoodReads, I've read 112 books this year. My goal for the year was 100 so I am officially putting this in the win category for the year! A few of those books were the Saddle Club series because I started walking down memory lane and couldn't put the books down. What was really nice was that I'm able to get them from the Orange County Library Media Mall which means no awkwardly walking into the children section of the library or putting them on hold. Two other series that I have really gotten into this year are the Finishing School series by Gail Carriger and the Throne of Glass series by Sarah J. Maas. Hopefully I'll be able to finish the Finishing School series this weekend, so expect that review to come up in the near future! If you've been around for awhile you'll notice that I fashioned this blog after my running, riding, and reading life. So you might be questioning what this whole "repeat" business is. I decided the other day that I needed a header for my twitter account and my facebook page. 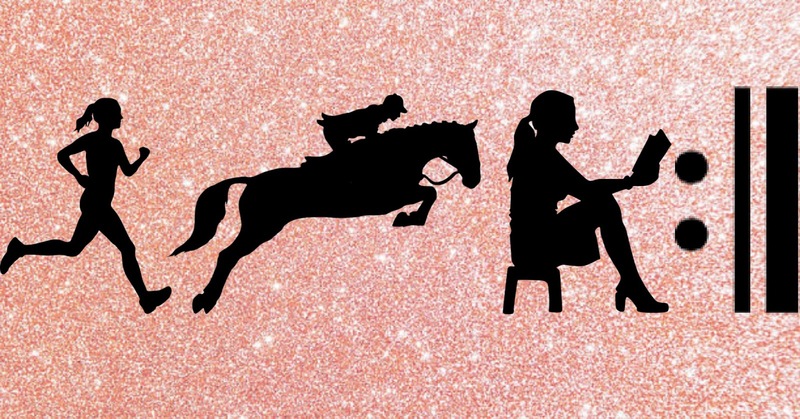 The plan was to do a running, riding, and reading silhouette on a glitter background. While putting this together it dawned on me to do a repeat sign so the entire blog title was represented. I looked up repeat signs to get an idea and had an "I'm an idiot" moment. In music, there is a sign that informs the musician to repeat a section, this is called a repeat. Because music is such a big part of my life and I've openly discussed it on here it only made sense to take the Repeat part of my title and have it represent the music portion of my life. I now present to you the newest "official" section of the blog. My Repeat section, or music discussion. With that little intro out of the way, it's time to discuss my year in music! In January I located a local orchestra that seemed like it would be at my skill level and was actively recruiting members, the Central Florida Community Orchestra. I signed up and attended my first rehearsal. It was terrifying and I almost walked away before entering the building, but I participated in that first rehearsal and loved it! 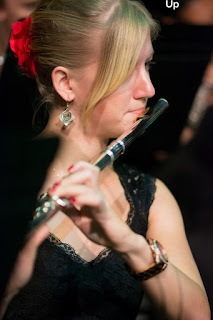 The CFCArts #FluteNation welcomed me and has pushed me to want to become a better musician. This year I participated in four different concerts with CFCArts; Jazz, Joel and John in March, American Roadtrip in June, Fiesta in November, and Once Upon a December in December. Once Upon a December was the first time, since college, where I've accompanied a choir. This pushed me to not only be aware of the rest of the orchestra but to also work on matching the choir without becoming the main focus. Without the Orchestra, I don't think I would have found a group that feels like home or had the drive to pick up the saxophone again! Overall, this is a quick review of my 2017. It was fun, it was great, but I can't wait to see what 2018 has in store for me! Riding horses is so much fun from what I've heard. Congrats on getting your run times down! Wow you achieved some amazing things! Riding and running are 2 wonderful activities I would love to try! It feels like this year has gone by so quickly. I am sad to see it over, but happy to start a new year. It looks like you had an awesome 2017, and will have a great new year! I could totally not play any instrument but good for you keeping so busy! I finally did my first 5k pushing a stroller and will definitely do more myself. moving your horses barns sounds like it was a good decision! I can't even imagine all the thought that went into making that choice. Good for you though for doing what was best for both of you. Congrats on reading 112 books!! I did 111 and it seriously feel so amazing! I also battle to find a medal holder that I like and so my run medals sit also in a box. Congrats on the book reads. I planned on reading 70 books this years and just did 45 according to Good Reads. Well done on all the 2017 accomplishments. I love your year in review and so need to write mine too. Sounds like you had an amazing year and big congrats! Wow! You've had quite the year. I'm so inspired to make a reading and a running goal now! Happy New Year to you - hope 2018 is just as accomplished as 2017 is for you! what a great year you have had! I bet you have made fabulous plans for 2018! It sounds like a great year! Congratulations on that 10k PR and the purchase of your beautiful horse Cupid!! Wow, absolutely love the four focuses of your blog!!! The only one I can really relate to is reading (hate running, allergic to horses, can't play a note!) but it was awesome to go through your year in review. Hoping your 2018 is wonderful! I'm so impressed with how much you've done in so many different areas of your life. I totally want to read more good books. I've read a lot of free Amazon books this year which hasn't been fulfilling. So I want to focus on reading more good books next year! You are motivating me to do more and make actual goals for reading and exercising! I only read 3 books this year and love to read so need to do more of it. Sounds like it was a great year and that you accomplished a lot! Congrats on your age group medal AND taking the steps to get back into an orchestra. Good Luck in 2018! You had quite the year! That is so cool that you were able to locate a local orchestra that you love. You had a very busy and exciting year! Congrats on all the accomplishments and setting yourself up for so much more success this year!